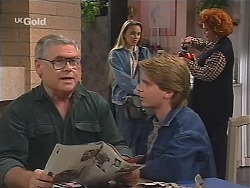 Brett tells Helen that he and Libby could run an article about Sid's plight in the school magazine. Annalise is getting to know her dad. Luke gets up to find Mark has been to the market and bought a hundredweight of vegetables. Ren also surfaces, looking very smiley indeed. Mark starts quizzing her about where she was last night but she says it's none of his business. 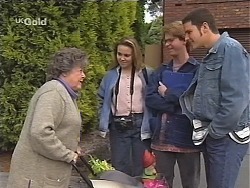 Libby comes around to meet Brett to go over to the allotment to see Helen and Sid. 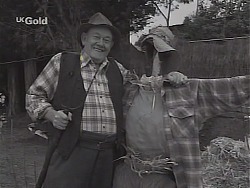 Brett asks Lou for a favour - a photo of the Mayor of Erinsborough throwing his arms around old Sid. Lou and Cheryl aren't convinced and asks Brett for a private word. Cheryl tells Brett that the Lassiter's project hasn't worked out the way they thought - the way things are at the moment, they may be about to lose everything they have. Brett is shocked. 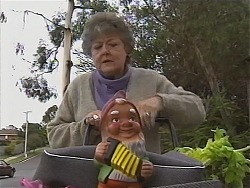 Marlene is walking along, pushing a shopping trolley containing a gnome playing an accordian (the gnome, not Marlene). Brett and Libby are just coming out of number 22 and bump into her. She introduces the gnome(!) and says she's just found him down at the bus stop! 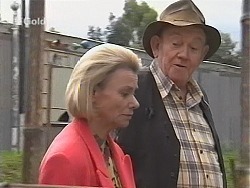 Luke comes over and Marlene asks him if he's seen anyone stealing gnomes from their garden. MARLENE: Every time I turn around, he vanishes! Libby and Brett walk down Ramsay Street talking about her and Luke. She thinks she'll just avoid men completely in the future. BRETT: I'm a man, aren't I? LIBBY:(smiling) You? You're a different species. BRETT: Was that a compliment?! Annalise and Jo are putting make-up on ready to go out with their Dad. They invite Sam to come along but he isn't very keen. Marlene comes in and announces that she found Albie (the gnome) down at the bus stop. Annalise, Jo and their dad head off. Marlene opens some letters and one of them is the phone bill - and it's massive. MARLENE: You've been gambling again, haven't you. MARLENE: Don't lie to me! I told you, if you started gambling again you could leave this house. SAM: Nan, I'm not lying! If you want me to leave, that's fine by me. So much for a bit of trust around here. 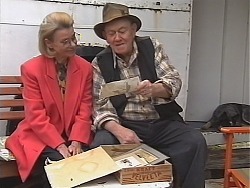 Helen and Sid are looking at old photos of Reuben and Sid. He tells Helen she can keep them. Brett and Libby come up and ask Sid if they can take some photos of him for the school magazine. He doesn't want to, but finally relents. They take a series of posed shots of Sid around the allotments. The Hartmans are having coffees. Mr Hartman tells Annalise that he's been putting money aside for her all these years. He gets the savings book out of his pocket and presents her with it - there's $10,000 in it. Annalise is chuffed. 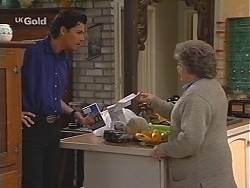 Sam is stomping around the house and insisting to Marlene that he's not gambling. Marlene points out that there's a 0055 number on the list and it's the racing information line. Sam says that Marlene probably rang it herself. Brett and Libby are on the top deck of the bus while Helen and Sid wander around the allotment talking about gardening and old-age. Libby tells Brett that they could help him out with the digging in the garden. Also, she wants to do her WorldVision essay on Sid. Brett says he wants to do it instead and they snipe at each other. LIBBY: I take it back. you're the most typical man I've ever seen. 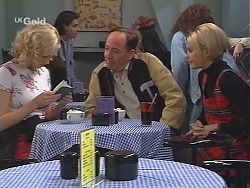 Helen and Sid are having coffee. 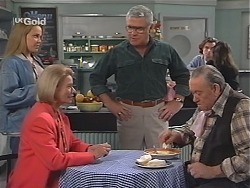 Lou comes over and tells them that Sid is to be the caretake of the Reuben White Memorial Fund - he's on the council payroll now, and also he won't have to move out! Sid thanks him and poses for a photo. Mark comes over and tells Luke off for not preparing enough pizzas then stomps out in a fit of bad acting. Jo tells Luke that she can't believe that Annalise was going to marry him once. Luke tells Jo that he used to host dinner parties and thinks it's about time to revive the tradition. Marlene comes in and shoves a wet branch in his face. She says it's an olive branch for jumping to conclusions earlier - she's sorry she accuses him earlier. Sam assures her that his gambling days are over and they make up. She still doesn't know who could have been calling the line though. Sam gets angry again and tells her to keep her olive branch. It's raining outside and Cheryl is cleaning out the cupboard under the sink. 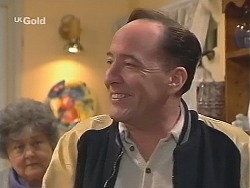 Lou tells her they'll get through their financial troubles together and he's had a thought - they can't get a buyer for the arcade so they'll have to raise the money elsewhere. He's been to see the bank manager who has agreed to let him sell the car yard. Cheryl says he can't - he loves the car yard, but Lou insists there is no other way. LOU: We are in this together. All the way. Annalise and her dad come home and notice the chilly atmosphere. Then the phone rings and Sam answers it - it's someone called Ronnie for Annalise's dad. While he's on the phone, Annalise shows Sam the purchases she has made today - mainly dressed. Annalise's dad gets off the phone and tells her he's got bookings in Darwin and Alice Springs - he'll have to leave almost immediately. He suggests Annalise comes with him for a bit of holiday.